The Joyetech eGo AIO is a fresh breath to the eGo Series Joyetech has become famous for. 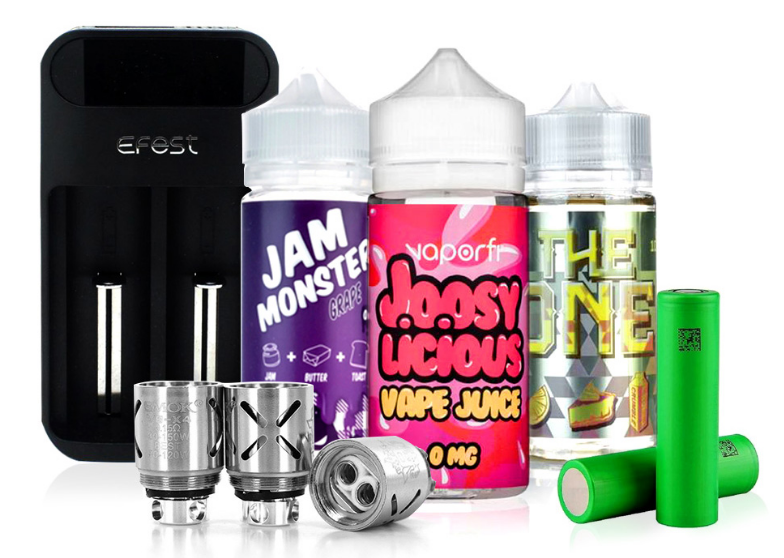 This impressive starter kit offers an all-in-one innovative design, capturing the essence of quick and hassle-free vaping. The Joyetech eGo AIO features a tank that has been built into the battery housing, delivering a design that is leak-resistant due to Joyetech's new “Cup” technology. Expect a new child-lock feature, a top fill design, a 1500mAh battery capacity that can be charged a via micro-USB cable and a tank illuminating indicator light that allows you to cycle through different color variations to truly make the Joyetech AIO your own! I've had good luck with Joyetech products and this is no exception. The AIO is a good beginning point for weaning off cigs but, also a simple, easy-to-use and affordable device if one just likes to vape-on without all the bells, whistles and technical accumen. I always order two at a time, one to use while the other is charging. Yes, keep the atty filled however, I've not had to micro-manage it. It will sometimes vary but I can get more than a month on one atty. The device does not like being upside down in my pocket, i.e., it will leak. Also want to say Direct Vapor has its act together with stellar shipping times and great customer service if you need it. I do hope they will continue to stock this model!!! I ordered this and it came in on time and as described. I like how the lighting on the pen can change colors if you want. Very good vape pen! It broke me off cigarettes - pack and a half per day. Received mine today, fast shipping. Easy setup and charge. Was enjoying vaping in a matter of an hour. Lots of cloud, a bit of heat transfer to bottom lip though. So I’ve owned this particular vape for about a year now and I’ve gotta say it’s one hell of a starter vape for anyone just starting out. I mean it has its glitches like the coils going out so fast no matter how great you pre pack your coils. I dropped this vape in a hot tub for over an hour and in the beginning I gave up on it, I put it in rice and whatever but that didn’t help and a month or so later I plugged it in and it began to work again. It’s been working for a few weeks now the only thing I’ve had to replace are the coils. I’ve dropped this thing numerous times and the glass is still in tact and it works like a dream and for only 20$ it’s definately worth it in my opinion. This vape is absolutely awesome. It's so freaking durable. I was using it at a concert and ended up chunking it across the crowd, by accident, hitting an inflatable ball that was going around and it still worked. Thankfully I didn’t hit anyone with it. Another time I was camping and left it outside during a thunderstorm- I had to change the coil, but it seriously still works. I was so impressed I had to write a review. Good: Works great as DL vape. Slim and portable. Looks nice. Bad: Do not use a long drip tip with this unit. The top is press-fitted in and will be worked loose by the additional stress of the longer tip. If you are a mouth-to-lung smoker, this device fills the bill. I've used mods and all kinds of devices, but always had trouble with leaking and spit-back. The mouthpiece on this has an inside spiral design, so no spit-back ever. But best of all, no more sticky hands. Price is right for sure. I vape a lot and can use 2 coils each week, but some do last longer for who knows what reason. I was a 2-1/2-pack-a-day smoker for 50 years and now am down to less than half pack a day and vape the rest of the time. I keep on trying to switch completely to vaping (face it, teaching an old dog new tricks can be tough), but this is the device to do it with because it is the most like the real deal as vaping gets. I absolutely loved this pen for the first month & a half. It never leaked, had a long battery life, & puffed like a dream. Then it started acting up. Basically everything I loved about the pen changed. It started leaking, everytime I picked it up I had oil on my hands then recently it would start burning without me even touching it & getting really hot. It started shooting out oil & it burned my friend's leg the other day (nothing serious but still). Now it wont hold a charge at all & just blinks randomly. It may be possessed by a demon or something else uncommon but I'm just going to do some research & find a more reliable/safer pen. I got this vape in January(2018) (Its now April 2018) and I loved it. I did ALOT of research on a simple vape with good flavor and clouds and it lead me to this vape. When I first received it I noticed the mouth piece would get very hot and I wasn't sure if that was normal or if I just got a bad vape. 2 months in the vape began burning through coils in one day. Let me be clear I didn't use it constantly, I *maybe* took 20 puffs MAX a day (I am in grad school and would use it to help with stress) so I wasn't over using the vape at all. I contacted Joytech and they told me to use a lower VG juice 50/50 or 30/70 (not the common 70/30) not only was the juice annoying to find but it didn't solve my problem. With all the research out there I would say this is a great product and maybe I just got a bad one. However, I cannot whole heartedly recommend because of these issues, I would be more likely to recommend if mine still worked. I was always nervous to make the switch from cigarettes to vaping, but for the sake of my health I decided to try. This is exactly what I needed. It's easy to set up, simple to use, and works really well. Plus inexpensive! Give it a try if you're looking to ditch the cigs, one week in and I feel much better! I had got this for a gift for my mom and myself one and I loved them so much I kept them and ended up buying my mom one. I have been vaping for almost 3 years now. I started with the original Ego batteries, but quickly got away from them due to leaking and no battery indicator. I was having to carry several of them around and lots of paper towels. Then I moved to a variable mod and used 3 different tanks on it. Same thing....constant leaking, bulky battery, no pass through charging. I used my variable mod for about 1.5 years and was finally annoyed with it as well. I purchased this on a whim at my local vape shop. While I love it I think that it has room for improvement. I will cover the pros and cons. I can't speak on longevity of the device since I've only had it for a couple of weeks, however at $20 if it lasts 6 months I will be happy. A new battery for a variable mod costs about that much. - Long battery life. I vape about 3 tanks a day, the battery has not failed me yet. The vapor does get less as the day goes on, but that's expected as the battery depletes. - Small size, fits in the palm of my hand. Great for on the go! - Using the tank LED as a battery indicator is fantastic! 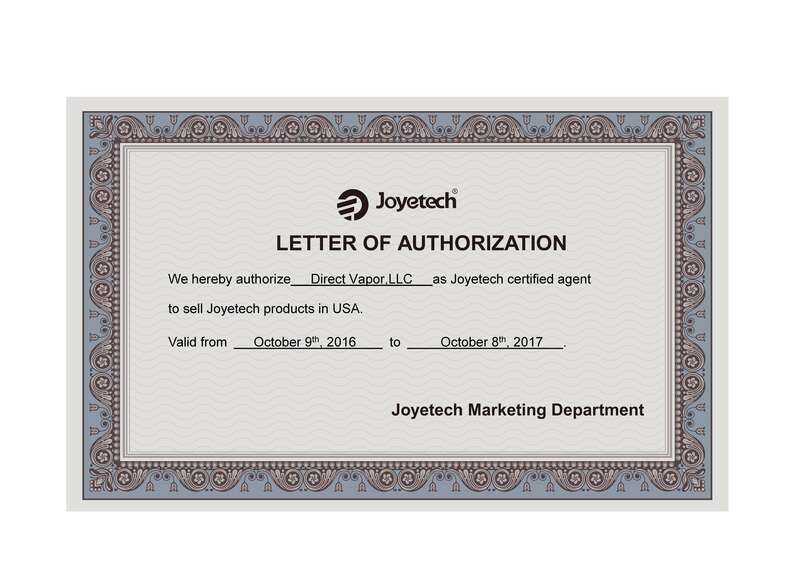 This isn't listed in the instructions, but it is listed on the Joyetech website and how it works. Be sure to check that out! - I have never liked to vape sub ohm, mostly because I would go through a lot of juice and I'm not interested in spending that much money. With the .6 ohm coils that came with this device, I was burning through 15ml of juice a day! I've done a bit of online research and spoke with the vape shop that I go to and nobody is saying I can't use the .5, 1.0, or 1.5 ohm coils that are made for the Cubis. I purchased some of the 1.5 ohm coils and my juice consumption is way back down to where it should be. My only problem I'm having is the coils are burning out fast. I've read a couple of tips online and people are saying not to tighten the top too tight because it causes coil burn. I've loosened the top and haven't had a problem since. I just started doing this today though, so only time will tell. Let me be clear, even the coils that came with this device burned out quickly. The juice holes are very small so I can see why this is happening. - The tank on this device is super small (2ml). I knew that when I bought it, but I didn't realize how much I would miss my 5ml tank. Especially with the .5 ohm coil, I was going through a tank every hour. This prompted me to purchase the D22 XL and that will be here this week! I'm super excited! I really do like this device. I wish they would make some side wicking coils to prevent the coil burn. If they did this, I would give this device 5 stars. I have been vaping non sub ohm for quite some time and I have annoyances with all of the devices I have used. If you are looking to quit smoking or looking to find a light weight device that does take up a lot of your pocket space, this is the device for you! I am so happy I found it. If all I have to deal with is burnt coils, then I will continue using this device. I've been vaping for a couple of years. I was paying less than I was smoking cigarettes and was able to quit smoking, thanks to vaping and have gotten down to 3mg of nicotine, hoping soon to drop to zero. This is the best device I've used so far. I had a Smoke Vape22 pen, which I really like. The problem I had with it was breaking the glass a couple of times. And they're hard to replace. I had to have it special ordered from my local vape supply store. Thanks to Direct Vapor's great prices, the Vape22 pen I got for $38, only costs $19.95 here!! This vape pen has the glass mostly covered by a hard metal cover, which also contains the battery. It is very easy to fill, makes great clouds, if you're into that. The light is really cool. You CAN turn it off if you do not like it and it will NOT be lit brightly while charging if you turn off the light before charging, which is simple to do. (One of the comments said it stayed lit and was annoying and bright-my suggestion, read the directions that comes with your device, and maybe watch a YouTube video on the device you choose.) You can change the colors from red, pink, blue, turquoise, green, yellow & white. It is really cool. I chose the dazzle color, which is similar to a titanium look. Glad I paid the extra $3.to get this color. The slightly thinner size than the Vape22 Smok pen makes it easier to hold in my small hands. It's so pretty! And the low price of $19.95 is awesome!!! My local stores charge $40+ for the exact same device. This is easy to use and would make a great first vaping unit. The choice of colors has something for every taste. Buy this vape pen for yourself and for gifts to get those cigarette smoking family and friends off of smoking and into vaping, which doesn't contain the over 1,000 chemicals, many cancer causing, that cigarettes have in them. Direct Vapor sells many flavors of oils that do not contain diacetyl or acetyl propionyl. I LOVE Direct Vapor and vaping better than cigs!!! Anyone that saves me money is great in my book! I've been able to quit smoking and feel better, too. This a great little pen. Mine stopped working but I had evidently cleaned too aggressively and pushed down the center post. Slimvapepen.com has suggestions on troubleshooting and I was able to fix my pen. Just look under FAQ. Works beautifully again. I was looking to stop smoking because I was getting horrible chest pain after smoking and starting to lose my voice. I unfortunately went to a local vape shop to get it since I wanted advice and didn't know what I should start with. So it was literally double the price that it is on here! Also it didn't come in the variety of colors they have on here. At least I know for next time if I need a new one I'll be coming on here to order it. I've only had it a few days and have been smoking it with a tropical menthol flavor in 12mg of nicotine. But I've had absolutely no cravings for a cigarette so far. I'm so happy I made this purchase. It's small and convenient. Great littler starter vape for the price. It does go through coils fast, so stock up. It also gets pretty hot pretty quick if you hit it repeatedly. Very respectable vapor production and nice airflow adjustability. Plus, it's super low profile and sleek. For the first couple days this vape was amazing! It produced great clouds and such but after about 4 days, it would randomly stop charging and get extremely hot. Vape juice would pop into my mouth while I was vaping. Then the dry burn came. No matter what I did, I couldn't get the dry burn to stop so I replace the atomizer and the dry burn was still there. To this day, my vape won't charge more than 15 minutes, vape juice still pops in my mouth, and I still have dry burn. I guess you get what you pay for on this. One positive thing I have to say about this vape is that I enjoy the amount of colors you have to choose for the light. I bought a couple of these to get into vaping with my wife to help her quit cigarettes. Upon arrival, we did everything it said to do to get started. It was dry hit after dry hit. After searching the interwebs, I found a couple of hacks to make them work reliably. I don't think they should sell something as a "stater kit" with these kind of issues. Now they vape fine, but I fear the experience has put my wife off of vaping. We'll see. I bought this model after an upgrade from the "Pen style" I've been using since I quit smoking cigs about 3 years ago. Wanted something a little more advance and powerful and this fits the bill! It came quickly and was in a nice sealed box that came with the device, coils and 2 tips as well as the charger cable. Its really easy to use! I like you can change the LED colors and it lasts all day. It is a good size as well for beginners and to fill and refill and change coils. I just bought a 2nd one for a backup! Good vapor production compared to the last basic model pen style I used to use! Fast shipping received very quickly 7 days in michigan. Which is fast from Florida, only shipping on weekdays.. Only advice I have is notice the coil head is not in the epen automatically. You need to put it in... But it works great!!! Overall this vape has been great. It hits well, is easy to fill with minimal mess (make sure to fill it to the max fill line, or else it spills over), and the coils last a while. The lighting is absurd though, and there is no way to turn it off. It shines bright as a flashlight in the dark, illuminating the entire tank, which is entirely unnecessary. It then lights up a second time to show the battery level, which not only wastes battery, but also shines a different color through any e liquid that is not clear. Stupid, stupid design choice. I would give it a 5 star rating if the light feature was a choice and not standard. Plain and simple... for the price this is one of the best starter kits you can get as a beginner or even a regular that needs something more discrete. So happy with mine! I have tried several vape pens. This is the only one I've found that can handle my "chain vaping". I have 2 of these and am not sorry for my purchases. I even bought one for my father-in-law. My favorite feature is that you can vape while it's on the charger. I will be buying more. I have been off of cigarettes for 2 1/2 years now. I've had this vape pen since November and haven't had to replace it yet. I was going through 2 vape pens every 3 months or less. i got this for my wife and after 3 days she does not smoke anymore. its is a great starter kit i wish i had one of these when i first tried e cigs ,ive been cig free for over a year now and she has been off for 2 weeks now .and both of us had smoked for over 30 years each. I'm new to vaping so I chose this as my starter, works great. No problems. Easy to use. Received 4 days after I ordered. I would recommend this product and directvapor as to very speedy shipping. I've been vaping awhile now, and the eleaf pico, with the mello 3 tank is the bomb. I wanted to get my son off the cigs, and research led me to get him this for his 1st vape. I'm happy to report this vape had him off the smokes in the first week, and he's already bought himself another for back up. This device is more than meets the eye. It's smaller than I originally thought but in a good way. There is no delay from the fire button and the build quality is better than I had hoped. The flavor from this tiny thing is incredible as far as pen mods go, probably the best I've tried to date. Totaly worth the $20 and then some. For those looking to switch from smoking to vaping, look no further. The restrictiveness is spot on and just enough vapor production not to choke you out. Direct Vapor is a top notch e-store! The shipping was crazy fast and the devices are legit! Well done directvapor.com, WELL DONE! Shipping was frigging fast, packaging done nicely and product was in pristine condition. I am new to vaping so for me this starter kit is bomb not much hassle. No leaking and great cloud production. I am happy for the price! I've been vaping for a few years and has had me off of cigarettes for over a year. Have tried a number of different devices and this one is bar far my favorite. I've used large box mods (tanks always leaked and didn't fit in my pocket), ecigs (no vape cloud and little flavor). Battery lasts all day, fits a decent amount of liquid, great flavor and did I mention it never leaks! Already bought my second one. Decided to try vaping and picked this little device up at local vape shop. Seems like a perfect little stealth gizmo. I've only had it a day, and don't know anything to compare, but does exactly what I wanted. Trying to quit gum/smoke loop I've been in for years. picked this up to curb my cigarette cravings when drinking and it did teh trick. great segway to vaping from butts. then i got pushed in a pool and killed it. i graduated quickly from it but for teh price you cant beat this if you are curious about vaping and quitting smoking its a great choice. I have had it for about month now, ordered one for sister as she liked it better than her ego style from a few years back. Nice draw and decent clouds. Its a great size and amazing price. I'm using it as a supplement or compliment to my Cuboid mini, the aio goes everywhere with me because it can. Fits in your pocket and hand nicely. It could almost be my only device, but I'm coming off 2 and half packs a day and it was working hard to keep up. The light option is nice, but even nicer the no light option for you ex smokers trying to be a more stealthy. The coils will work for at least at 2 weeks, you just have to remember to keep them moist all the time. I have 2. After I change it I ALWAYS put a few drops of juice in the coil so it doesn't dry out. I was having that problem at first but knew there had to be a solution so I looked on some of the review sites & found. Works perfectly now. Just remember to keep the coils moist. Ordered this for an employee trying to stop smoking. I already have one and it is a great starter kit. I ordered it on 6-11 and received it on 6-13! The atomizer gets really hot if you like to take 2-3 hits in a row, and you have to let it sit for a few minutes before continuing. Also, the coils don't last very long, so be sure to order more if you buy this kit! That way you won't be left waiting when you burn through the two it comes with! Overall, I really like the design. It is simple and efficient. The tank is easy to fill and keep clean, it seems to stay charged for a good amount of time, the special tip and the lights are cool, and it doesn't leak. Best starter vape ever with a great price! Easy to use.Different tank colors.Leak proof and ships great.I highly recommend this kit. I have been a pack a day smoker for 18 years. I haven't had nor wanted a cigarette for over a month. My last cig was 3 days after I got my vape. . Love, love, love the fruit loops flavor.. I just starting using a vape after smoking 2+ packs of menthol cigarettes a day. This vape is very easy to use. It doesn't take a hour reading directions before you start using it. So far it has cut back my craving 98% and that was my fault because the menthol flavoring I first got was like eating Vicks Sauve!! Now I have good tasting menthol flavoring and I haven't smoked a cigarette at all.